J Carpenter Environmental, LLC is CPI's exclusive representative for thermal oxidizer applications in the foundry industry where VOCs and HAPs are emitted during the resin coating of sand and during the pouring, cooling and shakeout operations. JCE also represents CPI in the Frac Sand industry where VOCs and HAPs are emitted during a similar sand resin coating process. CPI has unique, patented thermal destruction technologies that exceed EPA control efficiency requirements. There are more than 30 CPI QUADRANT SR Series Thermal Oxidizers installed at frac sand plants and foundries because the technology has the highest VOC destruction, the lowest combustion chamber temperatures and energy demand, and the longest life of competing products. The round design and floating tube heat exchanger protects against stress commonly found in antiquated "square box" designs. This helps to eliminates shell growth, which in turn, improves reliability and down time. Plus, the QUANDANT's unique center combustion tube and preheat system outperform all other designs in NOx performance. Recuperative Thermal Oxidizers: Thermal treatment of VOC's and other air pollutants works by a simple reaction of the harmful air pollutants with oxygen and heat. In this environment the VOC's are converted to water vapor and usable heat. These harmless by-products are released into the atmosphere or use an energy recovery technique to further lower the operational costs. QUADRANT SR-Series Thermal Oxidizers are considered among the world's most advanced recuperative thermal oxidation systems. These specially designed and proven systems combine the basic principles of time, temperature and turbulence to the fullest extent possible. The results provide you with exceptional performance, substantially reduced operating costs, and industry-leading reliability. The foundation of the QUADRANT SR-Series Thermal Oxidizer is our proprietary Floating Tube Primary Heat Exchanger. This design eliminates thermal stress and fatigue by allowing each individual tube to expand and contract at its own rate. No one else has this proven technology, no one else can match the stress free durability. These systems are easy to install, provide very high removal efficiency, and offer very low operating cost. With zero moving parts and the advancement of our floating tube heat exchanger, no other thermal (recuperative) oxidizer can match the reliability of the QUADRANT SR-Series Thermal Oxidizer. 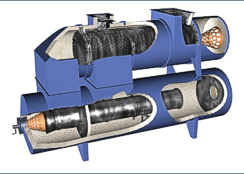 Regenerative Thermal Oxidizers: The TRITON Series of Regenerative Thermal Oxidizers represents the most advanced and most efficient thermal oxidizer systems in existence today. With thermal efficiencies of up to 97%, and destruction efficiencies that can exceed 99%, the TRITON Series regenerative thermal oxidizers will give you the highest possible destruction rates at the lowest cost. Each TRITON Series regenerative thermal oxidizer (RTO) is truly custom designed and built to your specifications. We begin with three basic models that offer varying levels of VOC destruction. We then take into consideration the specific characteristics of your air stream, such as quantity, temperature, composition and the possibility of incorporating Energy Conservation into the process.